Ellon Flowers is the perfect place to buy your loved one a gorgeous gift for Easter. The Ellon florists have an array of Easter flowers that will be sure to delight any recipient. Flowers Ellon have over 40 years of experience in the floristry industry. As a result they have the correct skills and knowledge required to produce stunning Easter flowers and gifts. The expert florists in Ellon are part of a wider network of international florists in over 140 countries worldwide. All florists working with Ellon flowers are professional and experienced. No matter where your loved one may be this Easter, you can easily order Easter flowers from the florists in Ellon and have them delivered to their door. Ellon flowers have a wide selection of already created Easter flowers including hand-tied bouquets, arrangements and other Easter gifts. These have been designed by an expert team of florists and there is sure to be something to suit all tastes. You can browse this extensive range of Easter flowers through Ellon Flowers’ online store. Furthermore, Ellon flower delivery offer a fabulous bespoke Easter flowers bouquet service. The expert Ellon florists will design and create stunning Easter flowers just for you. If you know what you would like to include in your bespoke bouquet, you can tell the professionals at Ellon flowers and they will include those for you. Alternatively, you may have no idea of what to include or of what your loved one may like, and in this case you can leave it up to the experts. No matter what you choose you can be guaranteed that your Easter flowers will be absolutely gorgeous. The Easter flowers available from the florists in Ellon come in great variety. You can choose from an array of species – all different in colour, shape, size etc. Ellon flowers will beautifully wrap your Easter flowers and provide a card for you to write a heart-felt message to your loved one for Easter. Here at Ellon florists we take care of the finer details and strive to make sure our high quality standards are met with each and every Ellon flower delivery. In doing this we ensure maximum customer satisfaction and guarantee that no customer will be unhappy with their Easter flowers. 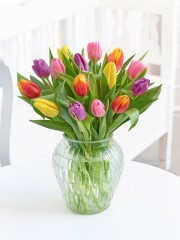 In addition to the gorgeous Easter flowers available, Ellon florists can provide numerous gifts. You may choose to have these gifts accompany your Easter flowers or you may wish to simply send these gifts separately, either option is achievable with Ellon Flowers. These Easter gifts include cute teddy bears, delicious chocolates and champagne truffles. Furthermore, the florists in Ellon can assemble a great balloon bouquet for your loved one. If you are unsure of what you wish to include in your Ellon flower delivery do not think twice before contacting the florists Ellon team today. Order before 3pm if you require same day flower delivery from the Ellon florists. Alternatively, there are a number of great, affordable flower delivery options to choose from depending on when you require your Easter flowers to be sent.